Baedeker editions covering Belgium, the Netherlands and Luxembourg in German. See also editions in English and editions in French. 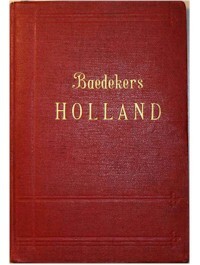 Belgium was the first "foreign" (in the sense of non-German - there was no unified Germany at the time) country to be covered by Baedeker. The picture, courtesy of Peter Blokland, is of the rare emergency reprint Holland, from the 25th edition of Belgien und Holland.